Cross posted from The New York Times blog, The New Old Age. For the first time since 2001, the American Geriatrics Society and the British Geriatrics Society have updated their guidelines for preventing falls in older people. The update includes two notable changes: One recommends tai chi — the meditative, slow-motion Chinese exercise — as an effective way to prevent falls, while another suggests that doctors review medication use by all elderly patients, with an eye toward reducing use of those drugs that increase the risk of falling. The earlier guidelines did not single out any particular exercise regimen and endorsed prescription reviews only for patients taking more than four medications. Exercise is essential for any older person who can manage it, according to Dr. Mary Tinetti of the Yale University School of Medicine, a chairwoman of the panel that issued the new guidelines. Tai chi gets the nod because several trials have suggested that it seems to help reduce the risk of falling, she said, although it is possible that other forms of balance training work just as well. Greg Fuller teaches tai chi at the Jewish Home in Los Angeles. “The basic underlying philosophy is that balance is everything,” he said. 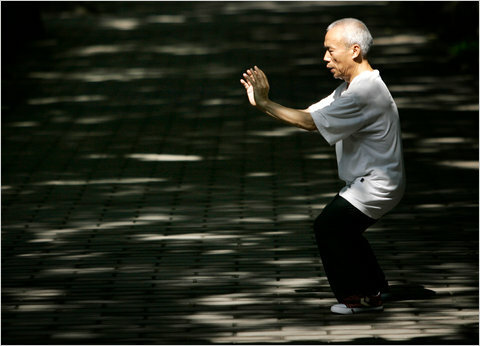 Most important for his students, whose average age is 90, tai chi involves small, slow, controlled motions. Confidence is important to fall prevention, according to Dr. Tinetti, who said that fear of falling can itself lead older people to cut back on activities they used to enjoy. The less they do, sadly, the less they eventually are able to do. The geriatrics groups also have long recommended that the medication regimens of older patients be reviewed and, if possible, scaled back. Earlier guidelines called for reviewing medications only if a patient takes more than four. This time around, researchers say that all older patients ought to have their doctors review their prescriptions for any that might increase the risk of falling. An elderly person worried or frightened by a fall. Two or more falls in the past year. One or more falls with injury. Repeated difficulty with balance when walking.